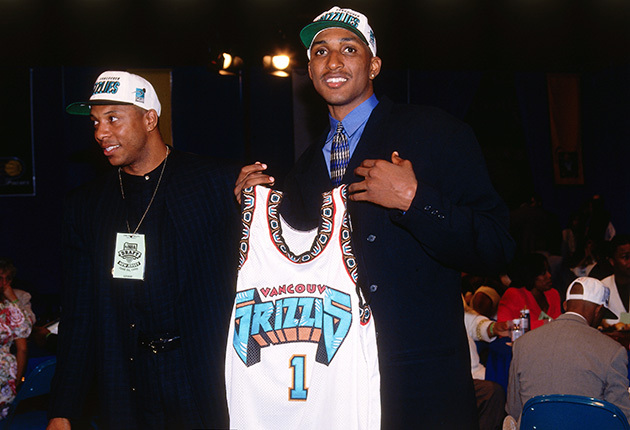 Few memories remain from the NBA's Vancouver Grizzlies experiment. The whispers of a possible move had been rampant for months. In an era before social media and real-time newsfeeds, the chatter emerged on sports radio and in local dailies, fueling speculation around the Lower Mainland. As the days passed in the spring of 2001, the end of the Vancouver Grizzlies started to transition from rumor to reality. And the list of potential relocation cities was long, spanning the United States, from coast to coast. The list consisted of St. Louis, Anaheim, New Orleans, and even the far-fetched idea of Las Vegas. But Memphis became the most likely destination. The fans knew it was over. They also knew it never really was. In six unflattering seasons, the Grizzlies won only 28% (101–359) of their games—the lowest winning percentage for a franchise in NBA history. They never made the playoffs, never produced an All-Star and never fully connected with the community. The team’s tenure was defined by poor management, bad contracts and missed draft opportunities. Although tourists praised Vancouver for its natural beauty and cosmopolitan society, free agents and potential draft picks viewed it as basketball purgatory. The league’s experiment into Western Canada was a flop. “I never felt we did well enough to pull them in where they could become die-hard Grizzlies fans,” says Shareef Abdur-Rahim, the Grizzlies’ franchise player at the time. Bad product or not, the fans still came out to get one last look on April 14, 2001. It wasn’t a sellout, but it was close, with the 18,571 fans on hand, falling less than 100 shy of a capacity crowd. Hosting the Houston Rockets at General Motors Place, or the “Garage” as it was known, in what was not only the final home game of the season but likely ever. But on this night the villain won. Just like it happened countless times in the past, the Grizzlies blew a 19-point lead before falling to the Rockets, 100–95. And just like that it was done. The team played two final games on the road, winning one. The Grizzlies officially moved to Memphis on July 4, 2001, and never looked back. And neither did the city of Vancouver. Evidence of the Grizzlies’ tenure in the city is hard to come by nowadays. There are no Grizzlies banners or jerseys hanging high in the rafters inside Rogers Arena (formerly General Motors Place). Nor are there old photos or sentimental memorabilia in the local sports bars. And perhaps the most amusing fun fact is that the Grizzlies’ former practice facility has been since converted into a laser-tag site. With few memories and an incomplete legacy, it was as if none of it ever happened. The Vancouver Grizzlies just vanished. ​A promotional billboard featuring Blake Griffin had hung over the Burrard Bridge in downtown Vancouver since the summer of 2015. The preseason game between the Toronto Raptors and Los Angeles Clippers had been sold out for months. With a capacity crowd and Drake tracks blaring in the background during warmups, there was a buzz in the air in Rogers Arena for that early October 2015 match. The matchup marked only the fourth time the NBA returned to Vancouver for an exhibition game. Clusters of Raptors jerseys and “We the North” T-shirts draped the arena. Years ago, the Raptors were rivals of the Grizzlies, but now they represent all of Canada. The Vancouver contingent erupted when Terrence Ross completed a fast-break windmill dunk—even after he was called for a double dribble. The city of Vancouver has flourished since the NBA left in the summer of 2001. With the manufacturing, construction and technology sectors thriving, along with an influx of wealthy immigrants, the population and economic growth in Vancouver has skyrocketed in the past decade. The city successfully hosted the the 2010 Winter Olympics and 2015 FIFA Women’s World Cup. In 2011, the Vancouver Whitecaps expanded into the MLS. In 2015, the Whitecaps are drawing crowds just under 21,000, which is among the highest in the league. In 2014, there were 11 players from British Columbia playing in Division I basketball programs. Both Robert Sacre (Lakers) and Kelly Olynyk (Celtics) played high school basketball in B.C. Vancouver establishing itself as a world-class city begs the question: Did the NBA give up too soon on the Vancouver Grizzlies? 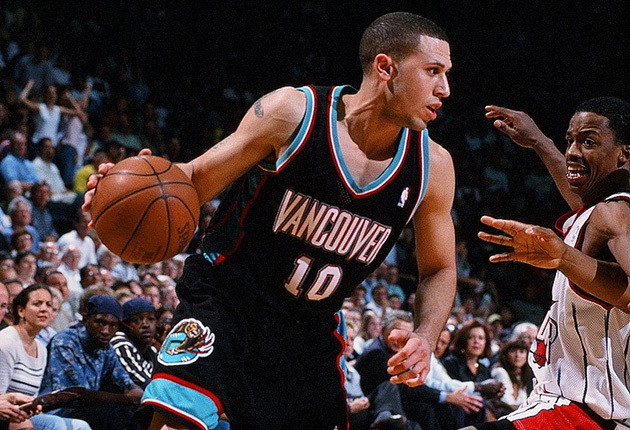 Mike Bibby admits he does not reminisce about Vancouver much. After the Grizzlies’ final year there, the 6’2” point guard vacated a downtown condo and never returned to the city in which he spent his first three NBA seasons—until this year. Now retired (he last played for the Knicks in 2012), the NBA invited Bibby back to Vancouver to partake in a series of appearances in conjunction with a preseason game between the Raptors and Clippers. Walking around the city before the game, he found himself lost. He remembered the rain, but had problems recalling what condo he lived in or which restaurants he frequented. During the preseason game, the memories came back to Bibby as old faces—arena workers, local TV sports reporters, former Vancouver Canucks players—approached him one by one as if he was at a high school reunion. Bibby, looking fit and youthful (hairline still intact), shook hands, smiled and briefly reminisced with each of them. While other thoughts were hazy, the second pick of the 1998 draft remembers struggling on the court in Vancouver. When the Grizzlies joined the league as an expansion franchise in 1995 (along with Toronto), the team was comprised of players from the expansion draft, like Greg Anthony, Byron Scott, Benoit Benjamin, and Blue Edwards. 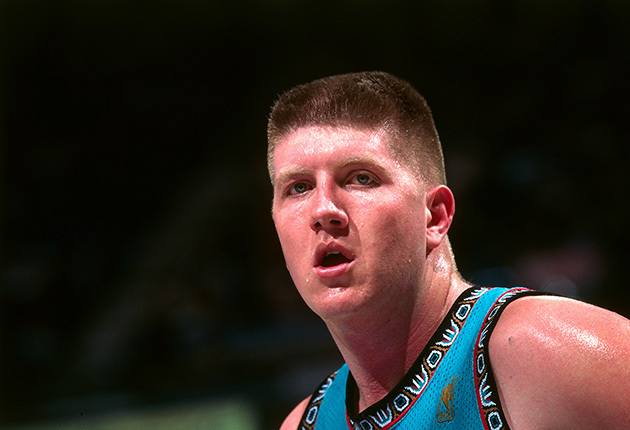 The first ever draft pick, Bryant “Big Country” Reeves from Oklahoma State, was looked at as the cornerstone of the franchise. On top of the losing, playing basketball in Western Canada was a culture shock for the players and coaches. There were subtle things like the incessant rain and lack of American sports TV coverage. Then there were the tax issues. “When they ran the pay stubs down to the locker room the first time, the players were shocked about how much money was out of their paycheck,” said Hollins. While hockey was still the preferred sport, the introduction of NBA basketball was a breath of fresh air for young fans across Vancouver. The Grizzlies had solid players in Abdur-Rahim and Bibby, but never possessed the right supporting cast. Stu Jackson, the team’s GM, has long been one of the public scapegoats for the franchise’s struggles. The team had five coaches in six seasons. He signed “Big Country” Reeves to a six-year, $61.8 million extension, despite the center being injury prone, inconsistent and regularly out-of-shape. He missed the mark with several draft picks such as Antonio Daniels, Stromile Swift and Francis, who openly warned the team not to draft him. And unlike the highlight-heavy Raptors, the Grizzlies’ on court product was a disappointment. Attendance gradually dropped each season and, by the late 1990s, the Canadian dollar also struggled. It hovered around 70 cents to the U.S. dollar. With the financial losses compounding, the team had already gone through two ownership groups before ultimately being sold to Chicago businessman Michael Heisley in January 2000 for an estimated $160 million. Although the previous owner, Bill Laurie, tried to move the Grizzlies to St. Louis, Heisley insisted that the team would remain in Vancouver. ​With cities like Seattle, Anaheim, Las Vegas and St. Louis also waiting for an NBA franchise to become available, the odds that the NBA returns to Vancouver in the foreseeable future are slim. For now, basketball fans in Vancouver are limited to just cheering for the Raptors, or if they really crave live NBA hoops, making the six-hour drive south to Portland. Based on the high turnout for the Clippers-Raptors preseason game, the NBA will likely return for future exhibition games. But that is seeming more and more like just a tease for the fans in Vancouver. On Griffiths Way, a dark street under an overpass that sits adjacent to the arena, a throng of young fans decked out in various NBA jerseys camped outside the underground parking lot at Rogers Arena after the game. They hoped to get autographs or pictures from Raptors or Clippers players as they departed the arena. More likely, they’ll just get a quick glimpse of the players as their large luxury buses whisk them out of town. While Grizzlies banners inside the arena are nonexistent, there are actually some proof points that the Grizzlies once existed in Vancouver. In the summer, you will see kids wearing throwback Grizzlies gear on the city’s streets, courts, and beaches. In the crowd during the preseason game, there were more than two dozen sightings of throwback Grizzlies jerseys—mostly Bibby’s, some Abdur-Rahim’s, a few of Big Country’s. Most of the teens who wear the gear are not old enough to have watched or remembered the Vancouver Grizzlies. Maybe it is just a fashion statement—the teal colors somewhat align with that hipster, Urban Outfitters-type look popular with that demographic. But perhaps it’s more. Three teenaged fans, two girls and a guy (all in jerseys) stood right across the street from the arena’s parking lot, not far from the rest of the crowd. All three said they were basketball players. One of the girls, Lauren Priest, a 19-year-old brunette, was one of those fans who owns a teal Bibby jersey. Although she has vivid memories of Bibby and the Grizzlies when they were here, she offered a more logical explanation of the return of the Grizzlies jerseys.